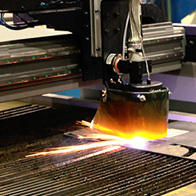 We have installed a new, state of the art High Definition CNC Plasma Cutter. Controlled by a complex computer system, the CNC uses electrically charged gas, or plasma, to precisely cut through steel up to 2.5” (63.5 mm) thick, producing parts with far greater efficiency and speed than our previous technology. 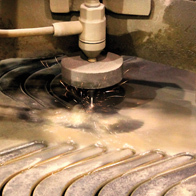 Our complex waterjet cutting system can, with the use of a highly concentrated stream of pure water and microscopic particles of stone, cut precisely through even the thickest steel plate to reproduce the pattern designated by a complex computer system. The result is a zero pollution process for precisely cutting steel parts formed to accuracies measured in ten thousandths of an inch quickly and burr free. This state of the art system expands our flexibility in a manner consistent with our lifelong commitment to using the best technology to bring the best site amenities to market at the lowest cost, in the most environmentally responsible manner. 101 queries in 0.233 seconds.